Hi All, It has been a while I did not post anything. Over the past few months, I started building an Island, then build a another island, then a ship to go in between. I exhibited this MOC in Swindon early this month. This was my first exhibit. Anyway, I hope you'll like it! Wow Peppermint, Sorry, I am seeing this fantastic creation just now... This fort looks so much like the cartoon one and seems to be amazing to play with. Did you try your change at creating figures of sgt Chesterfield and Caporal Blutcher? Travis, you are missing the point. You can't deny that by not doing a historic theme of any sort, a large portion of this community will be disappointed. If you look at the forums, the historic forum is arguably the most popular of Eurobricks. The fact that there are not historic theme is something we never experienced in the past and will lead to disappointment in this community. 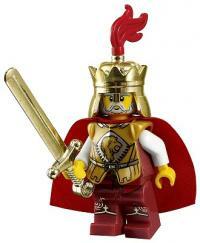 Specifically about Nexo Knight, I do not think that anyone would argue that Nexo Knight could not exist in parallel of another historic theme, like LOTR was at some point done at the same time as Kingdom Castle. We know all know that this is a kids toy, but this community is composed of AFOLs. I disagree... There is a real void this year in regards to historic themes - not only castle, but also pirates, westen, or licensed historic themes such as Lord of the Rings, Pirates of the Caribbeans, Lone Rangers, etc... I think a very large portion of AFOL who typically like historic sets feel disappointed this year. That being said, this year has been fantastic for my daughter: Disney Minifigs and plenty of Disney licensed sets. My first MOC was also around the kingdom theme... but was certainly not as good as yours. The whole castle is very nice and everything fits together... Great job. Beautiful... This might be one of the most beautiful fence I have seen. The overall color scheme is great too.